Golden Oak welcomes Snow White and the Seven Dwarfs to Marceline! Who's that cute little fella snoozing on a bench in Marceline's new Charming Park? Why, none other than the inimitable Sleepy from the Disney classic movie, Snow White and the Seven Dwarfs. And look by the reflecting pool, where the lovely Snow White is singing with the baby bluebird that's perched on her hand. Playing here and there, totally adorable as always, are Doc, Happy, Sneezy, Bashful, Dopey, Grumpy and more forest friends. Much to the delight of our residents, this magical vignette of cheerful, life-sized bronze characters recently made its debut at Marceline's Charming Park. The scene is the newest addition to the Golden Oak community sculpture series, which enchantingly commemorates Disney friends in nature. 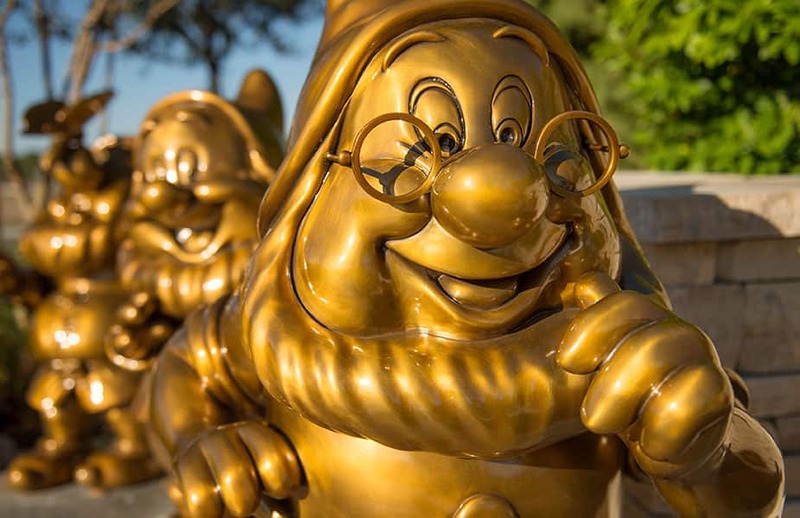 "The sculptures are so captivating and look so real, you almost expect them to start yodeling 'The Silly Song'," said Page Pierce, vice president of Disney Resort Real Estate Development. "There's such a sense of fun, Disney magic and heritage all around. It's a superb spot for memory making and picture taking." A hip-hip-hooray and heigh-ho to Snow White and the Seven Dwarfs, now at home in Charming Park! We're pleased to have them join previous arrivals Bambi, Thumper and Flower (near the entrance to Carolwood) and Ariel and Friends (near the fountain on Dream Tree Boulevard).